In addition , after Mass at St. Vincent's on Sunday 12 November as part of the community's Sharing the Journey programme, Peter and Madge will speak about their connection with Ted over many years. Who knows, Peter might even sing a song or two. Today I attended mass at St. Vincent’s Redfern. I went to communion and the parish priest initially refused to give me the host and waited for me to open my mouth to receive it. When I persisted and stood with my hands open, he eventually placed the host in my hand. I then walked down the aisle of the church where I broke the host to give half to a parishioner who has been too traumatized to receive communion from the Neocatechumenate priest. The priest chased me down the church aisle and demanded that I return the host. I refused and gave half the host to the parishioner. Might I add that there are a number of people who feel that they cannot receive communion from this priest because of his attitude towards those who do not follow the Neocatechumenate Way. People come from distances to share in the Eucharistic meal and see themselves as denied or cast aside. This is the story of the Redfern parish. But it goes much further than this. The actions and the position of the priests of the parish have been endorsed by the Archbishop of the Sydney Archdiocese who has referred to many of us as The Rump of Redfern. He also infers that we are only glorified social workers handing out condoms and syringes. Such an inference is a fabrication of the truth and a means used by the Archbishop to attempt to discredit and even vilify those who seek to live and understand the integrity of the Gospel message. This is somewhat ironic if we reflect on the readings for yesterday’s Eucharist. Isaiah talks about the suffering of the lowly Human One. The Book of Hebrews endorses and strengthens those on the journey of faith by exhorting to “Never to let go of the faith professed”. That was to prepare for Mark’s Gospel message where Jesus, after renouncing social power, is weary of explaining to the disciples what his message is all about. It was not for them to jockey for the first and second position in what they perceived as his political cabinet. What was asked of them was whether they were willing to undergo what he was undergoing. That is where we, the supposed Rump of Redfern are at. We feel that we have been betrayed and lied to. We are saddened by the dismissive attitude of so much of the official Church towards fair and honest criticism. For over three years we have waited for the Archbishop to dialogue with us and understand our position. He has consistently refused to do so. Instead he called on a junior bishop to step in and all he did was to sanction calling the local police. The police in turn said that it was a matter for the parties concerned to work out a solution for all concerned. A solution seems light years away because of the totally dismissive attitude of the church authorities. The Church Regional Tribunal for New South Wales has found a priest of the Neocatechumenate movement guilty of defaming a long time parishioner. The Tribunal’s definitive judgment was that the priest had defamed the parishioner by publicly insulting and denigrating her. Such defaming continued for some eighteen months. The priest did not exercise the right to appeal the decision of the Regional Tribunal. The officials of the Sydney Archdiocese have remained silent. Continually, the message from the pulpit is conformity to their ways. They are right they say because they have the full backing of the Cardinal. In many ways one feels this is almost surreal, as though we are living out the story of the Grand Inquisitor in Dostoyevski’s ‘The Brothers Karamazov’. The Inquisitor told Jesus when He returned to earth in Seville that there was a fundamental error in the Gospel message. Jesus had preached that humans should freely give up the flesh and follow Him. This was an error in the eyes of the Cardinal Inquisitor. For him only a very few have the strength to follow the radical teaching of Jesus. The ordinary folk cannot make their own way and can only find happiness by forsaking their freedom and turning their affairs over to the church. It is then that they will find happiness. The end result was that Jesus had to die again for the safety of the Inquisitor’s church and his authority. This seems to be the situation in our church in Redfern. Where to from here? I doubt whether becoming the Catholic Hillsong brigade will ever bring us closer to the Gospel message. But that seems to be the aspiration of the leaders of the church in Sydney. All that we ask for is that we will be listened to and that we will not suffer the indignity of being treated as The Rump of Redfern. The following statement was read out to the congregation before yesterday's 10am Mass. 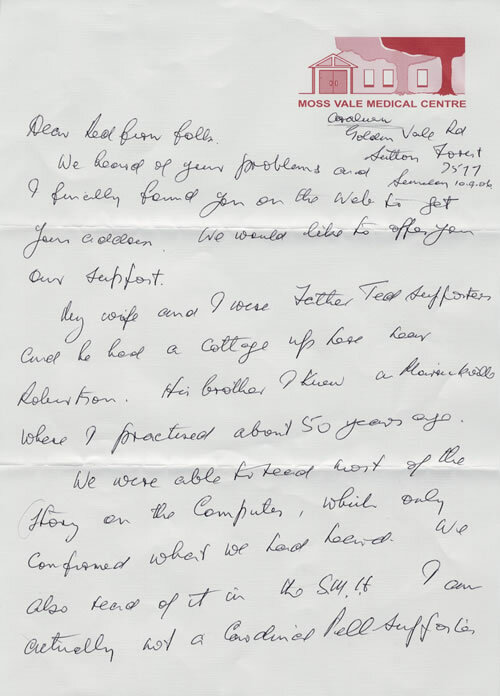 The St Vincent’s Parish Bulletin distributed on 19-20 August 2006 included an extraordinary item entitled “Apology”, which was presented without explanation. This issue of the Bulletin was in very short supply for the Sunday 10am Mass and had been printed on two-week-old “Saving Word” stationery. This deterred many people from picking up a copy. Nevertheless none were left by 10:05am. Equally extraordinarily, on the preceding Friday the parish priest handed an envelope containing a money order for $200 made out to Sharing the Meal, bearing the name Dennis Sudla, and issued at the Redfern post office on 16 August 2006, to one of the Meal helpers. The following should help fill in the background. The Bulletin item was no doubt prompted by a court case that has only very recently been finalised by issue of a Decree. The case pertained to repeated unprofessional behaviour by an Assistant Parish Priest towards a long-term member of this parish. It was heard, not before the Civil Courts, but the Catholic Church’s Ecclesiastical Tribunal which deals with issues related to Church (or Canon) Law. The Church’s judicial system provides the means whereby Catholics can vindicate and defend the rights they enjoy in the Church. However, Church law requires all members of the Church, and especially bishops, to strive earnestly, with due regard for justice, to avoid litigation among themselves and to settle disputes promptly and without rancour. Between July 2004 and May 2005 Fr Dennis Sudla, the assistant priest in the parish of Redfern and member of the Neocatechumenal Way, repeatedly defamed a parishioner, Ms Clare Maguire. Having failed in her attempts to resolve the matter through numerous non-judicial processes, Ms Maguire was left with no other option but to lodge a petition before the Church’s Regional Tribunal for New South Wales and the Australian Capital Territory. She had tried nine different agencies within the Church hierarchy over a period of approximately two years. Most efforts were redirected to the Archbishop, where they foundered. The case took almost 18 months to run its course. It involved the preparation of a petition, the gathering of character references and witness statements, and a personal interview. The outcome is a 19 page judgement with findings, list of recompense and recommendations. The Tribunal’s definitive judgement was that Dennis Sudla had defamed Clare Maguire by publicly insulting and denigrating her. He did not exercise his right to appeal the decision of the Regional Tribunal. Church law requires that anyone who unlawfully causes harm to another is obliged to repair the damage done. Clare Maguire petitioned the Tribunal that Fr Sudla be required to offer her a public apology for defaming her. Although she had the right also to seek monetary compensation, Clare specifically requested that she not be awarded any such compensation for the harm she suffered. Instead, she requested that Fr Sudla be required to make a monetary donation to Sharing the Meal. The Church’s procedures require the Tribunal to issue a specific direction that its judgement be executed. 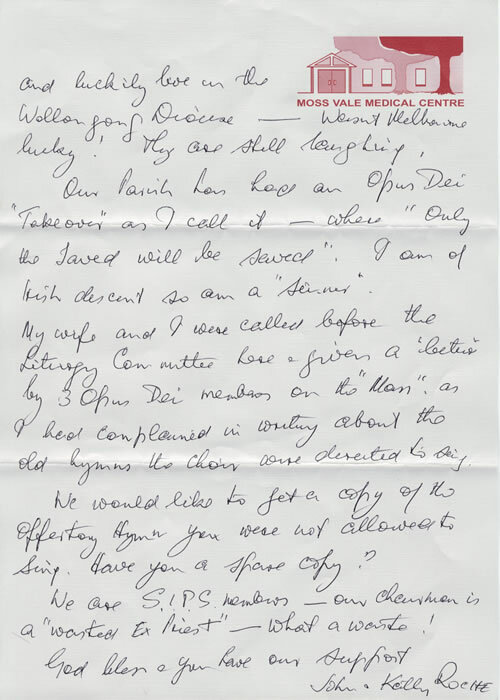 Before any direction was issued, the aforementioned Parish Bulletin carried a brief apology from Fr Sudla, in which he made no reference to the decision of the Tribunal. Moreover, he said in his apology that he “did not intend in any way to defame” Clare Maguire. His statement is contrary to the judgement of the Tribunal that found Fr Sudla was aware he was violating Clare’s right to her good name and that he intended to do so. It is the Church’s teaching that the right to a good name is one of the universal and inviolable rights of the human person. All members of the Church must be held accountable if they violate that right. We are grateful that this matter has been brought to a just conclusion through the Tribunal, but dismayed at the personal cost of seeking justice within the Church: at the drain on physical and emotional health. We are saddened by the dismissive attitude of so much of the Church towards fair and honest criticism when there are so many other issues to resolve in this place. After more than three years it’s time that our Archbishop made an effort to listen to and genuinely work with us towards equitable solutions. Perhaps he might begin by fairly and honestly reconciling these words with the Tribunal findings. The correspondence between the good folk from Toukley (see Standing in solidarity - Friday, September 01, 2006) and the Cardinal continues. This letter, written after a visit to Redfern, received a terse and sarcastic reply that is not worth publishing at this stage. Many thanks for your letter of 30th August 2006, the majority of its contents being a copy of your Press Release of 1st. August 2006. Before answering, we thought it prudent to pay a visit to Redfern Parish and experience the situation ourselves. Three of our group including the undersigned attended the Eucharistic celebration on Sunday, 17th September 2006. There was joy and sadness – joy at the lovable and friendly Community atmosphere, sadness at the complete isolation and behaviour of the Priests. There were certainly no signs of provocation by those attending the Mass. The attached notes will illustrate to you what we mean. How can you expect to have more Aborigines attending Mass when the Priests are behaving in this fashion? You say in your letter that you have offered to discuss the situation with those who are discontented. We understand that all attempts by the Community to contact you have been in vain, in fact a letter dated 21st. May and also published in their newsletter “Church-Mouse”, signed by some 120 Parishioners, has not been replied to by you. The Community would like to enter into dialogue with you as their Bishop. Surely, such a discussion would preclude any conditions by you relating to the presence of the Priests of the Neo-Catechumenal Way. In fact, the Priests of this Parish appear to lack basic people skills! We have been told of shouting and ridicule by the Priests independently by various Parishioners. You mention in your letter Father Ted Kennedy’s immediate successor. We understand that this Priest was not at all well during his time at Redfern! The missionary family you mention is in total isolation. They do not engage in any contact with the Community and appear to be Neocats. Attempts by the Community have been in vain. Why is the Saturday evening Mass celebrated in the Presbytery and not in the Church? Why is there a separate Mass in the medical center and no Mass allowed in the Church? Finally, we draw your attention to the Bishops’ Social Justice Statement where Father Ted Kennedy and his work was mentioned. Surely, every effort must be made to continue the noble heritage of this remarkable Priest. His criticism of the Hierarchy only puts him on equal footing with Blessed Mary McKillop! Dear Cardinal Pell, we urge you to fulfil the wish of the Parishioners to enter into a meaningful dialogue and restore peace. When we arrived at 9.50 am for the 10 o’clock Eucharist, the church was empty. Aboriginals were gathered outside and were quite friendly. The mural of contention looks great. At 10.00 worshippers started arriving, and we were immediately welcomed and introduced. There was a remarkable friendly atmosphere all-round. 10.10 The Mass commences – 3 Priests concelebrating, the main celebrant being the young Assistant-Priest Father Clesio Mendes. The Parish Priest was concelebrating as well as a visiting Priest from Western Australia. After the entrance procession, an aboriginal rushes forward and places a black cross in front of the altar. No welcome by the celebrant, no introduction of the visiting Priest. The readings were introduced by John (a member of the Community – an excellent introduction of the meaning of the readings). Prayers of the Faithful were read by the Main celebrant out of a book to which he added two petitions of his own. The Community actively participated in formulating topical and relevant prayers including one relating to the Pope’s visit to Germany. The prayers were cut short by the Priest! The Priests did not participate in the communal singing, in fact looked bored and at times annoyed. After Mass, the Aboriginal rushed forward and collected the cross, and the Priests walked out into the Sacristy – there were no good wishes for the Community and no contact at all with the people after Mass. Present during Mass were two large family groups (we were told they were of Italian/Spanish background). They did not mix with the general congregation, or take any active part in the Eucharist. These people were obviously part of the Neocat community. Afterwards, we remained talking to the people who are those who have not ‘caved in’ to pressure and remain fighting for their beloved community, although small in number, one of the most friendly and remarkable that could be envisaged in any Catholic/Christian gathering. They inspired us with their determination and courage to fight on to retain the ideals of their beloved Father Ted Kennedy (RIP). Father Ted’s sister, a Sacred Heart nun, works with the aboriginal community, and is an active member of the parish. There are a small number of dysfunctional people present among the worshippers. We saw active support and outreach to these people. Other previous members of the Congregation, we hear, have succumbed to pressure, and are worshipping at nearby Newtown Church. The back of the church has been set up for sharing a meal twice weekly with the marginalised. Numbers fed, about 150 each meal! There is only a small facility for heating food and no running water! The Neocat priests take no interest/active participation in this ministry. We found a disparity in the fact that large premises used as a presbytery for the Neocats were paid for by the Diocese (between $800.900 per week) whilst requests for running water in the back of the church have met with silence. We were invited to join Parishioners in the nearby Cana Café, where there was a lively atmosphere of a loving Community. The intellectual standard is quite remarkable. The general consensus is that the Neocats have outlived their welcome. There is no Saturday evening Mass in the Church, but it is in the Presbytery and visiting Priests are not allowed to celebrate Mass in the Church for Parishioners who do not belong to the Neocat Movement. For a while they celebrated Mass, if any, in the nearby Aboriginal Medical Centre. There is heavy criticism all-round by Parishioners of the Parish Priest who does not seek contact and does not participate in communal activities. All requests to Cardinal Pell for visiting them and sorting things out have met with silence. Can the Church love enough to listen? In listening, can it dialogue? And if it dialogues, will it change? Whether by coincidence or serendipity I attended two talks in one week that were by fact destined to be related. The first was the launch of the Australian Catholic Bishops’ statement for Social Justice Sunday titled: The Heart of the Country – Dignity and Justice for our Indigenous sisters and brothers; the second was a talk by Fr John Prior SVD which focused on the importance of dialogue in Asia as way of engaging local culture and people in a Church that faces extinction. It was titled Mission as Dialogue: Compromise or Confidence. The common ground for the discussion struck me as the need for the Church to openly engage in dialogue to address the past pain and trauma, to bring reconciliation and to create a realistic vision of the Church’s mission. While these goals were reiterated by John Prior, the complexity and prerequisites for this process must be fully investigated if they are to be achieved. One extract from the Social Justice statement succinctly makes the point. It quotes Pope John Paul II from 2001, “it is the Churches' task to help Indigenous cultures preserve their identity and maintain their traditions”. Another continues: “The Churches' dialogue with cultures of our time (is) a vital area, one in which the destiny of the world… is at stake.” These themes were echoed and expanded by John Prior giving reference to the work of the FABC (Federation of Asian Bishops Conference). What has changed since the Pope spoke in Alice Springs 20 years ago? Why are the circumstances that Indigenous Australians live in still so poor and embarrassing? Any answers are determined by the lens through which you view the questions. It depends on the focus you choose to consider, whether it be health or land rights or justice. The lens which I was forced to consider while sitting listening to John Prior was the role of the Church. How does the Church, which includes you and me, reflect its commitment to Indigenous people in the way it operates, organises itself and celebrates liturgy? It is important for me to clarify what I mean by the word, Church. For me Church represents my experience as a lay parishioner who participates in liturgy in a local parish. The Church is often understood as the congregation that celebrates the liturgy together. However, power and decision making in the Church are not shared by this group. There are Parish Councils which make recommendations, but my experience of councils is that recommendations can be, and have been, overturned by local priests. I acknowledge that there are a variety of interpretations and meanings given to the word but I think I would be accurate in assuming my experience is the quite common. The recent events in Redfern -- surrounding the painting on the church wall of a mural quoting the Pope in Alice Springs 20 years ago, and the subsequent media coverage with comments by the local Parish Priest in which he called the mural vandalism -- remind us that the Church is not one voice or even the voice of the congregation. It reminds us that the conversation is not equal; that the parties do not share power and there can be pressure on Indigenous people to join a non-Indigenous conversation and agree to participate in a celebration of Jesus that was not developed to respond or incorporate their culture. “Fr Gerry, last Sunday during the celebration of the 10am Mass, you left the altar at the Offertory, for your stated reason that you regarded the words of the Offertory Song as ‘political’. “Your action, of walking out and thereby terminating the celebration of Mass, deprived us of our Sunday Eucharistic celebration and of our bread of life for the week’s journey. This is a violation of the community and of your own priesthood of the Jesus who came to serve. It was a violation of ‘the norms and traditions of the Church’ that you say in your letter ‘must be respected by all’. To be marginalised is one thing; to be different another; but to be refused the Eucharist represents a very serious choice by the Church which is first called to act as Jesus on earth. John Prior pointed out that the Asian Bishops Conference has been motivated to begin dialogue in response to a similar circumstance that has led to the local communities feeling excluded, their culture itself being denied. In Australia the Church has also found herself responsible for behaviours, policies and practices that have hurt Indigenous people and one wonders whether Redfern is an instance of this. I am not Indigenous. I am however female. So, like Indigenous people, I am participating in rituals and ceremony that have been designed by men and, in my view, have not incorporated the ways and culture of women in their deliberations and decisions, let alone ceremony. At a practical level I am in the 12th year of being banished to a crying room, where they exist, with toddlers; a solution suggested to me by my parish priest. Other options included leaving the children at home, my husband and I attending separately, and if we insisted attending Church as a family, only attending mass when a children’s liturgy was available. The humiliation of the visit -- in 2003 not 1903 -- with its subsequent suggestions was enough to send me, if not to the crying room, out the back of the Church. So it is with much seriousness that I wonder how honest and serious we are as a Church when we propose communion with Indigenous people or the people of Asia. Dialogue, it is true, is the key to any movement together but as we all know no other interaction is so fraught as a conversation. The truth is that the primary prerequisite for any dialogue is a talker and a listener. The talker is never hard to find; the listener is often elusive. When I began to consider how the Church prepares herself in order to listen, I began to consider the qualities and prerequisites that facilitate the same skill in me. If I were to list the prerequisites for active listening in myself they would include respect for the other party; to have time; to have a goal for the dialogue (conversation); but most importantly, a quality that I am too slowly developing with age and experience, self assuredness, peace or self confidence which often comes from healing that allows me to listen openly, without needing to defend a notion or position, with a view to knowing more or becoming more. The question then becomes: How does a Church become self confident, peaceful, and self assured in order to listen to other ideas, ways, thoughts and behaviours? One answer is through healing, by offering forgiveness and being forgiven. Another answer may be by modelling inclusive behaviours. For women, changes in language from male-oriented words to neutral expressions have marked a symbolic but crucial change. Another may be by being realistic about what we want and expect from the dialogue knowing what can change and what we can’t and being honest and open about that. Fundamentally, we must find the common ground, which can be simply stated as a universal belief: love is good. The fact remains that the Church, which includes you and me, can only enter a dialogue if we are truly open to the possibility of hearing new things, listening and not defending, celebrating difference and doing things differently. One other feature of dialogue that I have been drawn to again in my experience as a woman is the capacity I have to influence the decisions that are made in response to the conversation. Women are very familiar with discussions that are held and then referred to a group for a final decision that largely excludes their voice; parliament may be a ready example. “As usual, whenever we as a community or as individuals try to engage you or your fellow priests in dialogue, our efforts are met with stony refusals to engage. Rather, you choose to assert your authority as priest as if that should be the end of it.” August 27. Therefore, if the Church begins a dialogue it needs to consider its own position in order to avoid tokenism, or time wasting. In the launch of the Social Justice Sunday statement Fr Brian McCoy told us we must look back to look forward. What has changed in local parishes and how will things change in response to the statement now? Do local parishes acknowledge the Indigenous people as the custodians of the land on which their churches stand? Is there evidence of Indigenous culture, art, ritual in our local parishes? Is there the opportunity for dialogue? My mother always said: “Don’t tell me you love me, show me.” I think we should do both. Certainly, words are not enough. Recent developments in psychology and social work show that while looking back is important, we also need to identify resilience and strengths, acknowledging that victims are strong by the fact they have survived. We could ask ourselves: What are the positive stories we tell, promote or publicise of Indigenous peoples’ resilience and strength and achievements? In Hebrews 11 we are reminded that: "To have faith is to be sure of what we hope for, to be certain of things we cannot see." And that this Church is loving enough to have disabled access and a ceremony that appeals to children; a Church that seeks to love first in all its activities and to put that above history, tradition and power. Mary Bryant is the mother of six children aged 3 - 12 years. She is a social worker who is particularly interested in the intersection between spirituality and social work practise. This includes writing and researching ways in which we can weave the values of Catholic social teaching into the work we do and the way we do it including policies and procedures of not-for-profit agencies. She is particularly interested in women's issues and her experience as a working mother have only heightened her passion for equality and structural change that assist women to combine both vocations. The Church Mouse has received several requests for the words of the Offertory hymn that was so political that the Mass on Sunday 20 August 2006 had to be aborted and the congregation denied the Eucharist. The hymn has been sung pretty much every Sunday since that unfortunate day without consequence. A message that was oh so clear. Of Love and Truth and Justice. But now we have the tree upon the wall. Blessed by everyone who understands. A message for everyone to see. A challenge to those with their own plan. The hands tell us who really own the Land. The tree itself is a message as it stands. A life that simply can not be cut down. This life deeply rooted in the ground. Let the tree bring them in. Spirit filled prayers bursting forth. Filling all with Truth in need. Renewing hope for new life here.